The Late Show with Stephen Colbert airing live, Wednesday July 27, 2016 in New York. ©2016CBS Broadcasting Inc. All Rights Reserved. 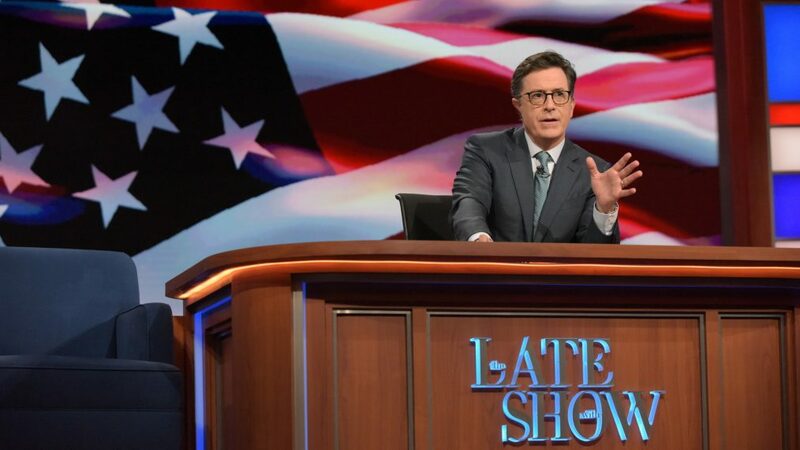 The Late Show With Stephen Colbert won some of its best ratings and critical reviews during live coverage of the Republican and Democratic conventions this summer. On September 26, Colbert will go live again, following the first presidential debate. Covering this extremely volatile campaign has given his team the opportunity “to be doing what we do best,” Colbert says, “which is the most topical jokes you can do as quickly as you can, consistently, night after night.” The acerbically witty host gives us a taste of what we can expect when he skewers Hillary Clinton and Donald Trump after their initial down-and-dirty verbal duel. As a political satirist, on debate night are you aiming for an ethical good or do you just want to make us laugh? There’s an ethical good in laughing! I’m not a pundit, though I played one for many years. I’m looking for opportunities to make jokes over a campaign that I think is making people nervous and hostile on an unprecedented level. So I just want to make people laugh at the end of the day after listening to the candidates go at each other with hammer and tongs. If you were moderating, what’s the most important question you’d ask Clinton and Trump? Hillary Clinton I would ask, “How are you feeling? Do you need a chair? How many fingers am I holding up?” And for Trump I would say, “Define the word great. You will “make America great again”? Can you be more specific? Which scandals have been catnip for you? Any time a candidate reinforces the narrative that already exists for them is fantastic for a satirist. If Trump is a vacuous, bloviating demagogue in a particular speech and changes his opinion in the course of a single breath, you get to pull out the knife you’ve already sharpened. For Clinton, there’s the narrative that she is intensely secretive, keeps the truth from the press and is sickly. If she does one thing that encompasses all of that, it’s like Christmas morning. Do you have any concerns about pulling the show together on such a fast turnaround? We like doing something right after it happened because if you have passion about what you’re talking about, the audience can feel that in your writing. The debates end at 11 and we go on at 11:35, which gives us a half hour to finalize an hour show. Wish us luck!